Chemical peeling is an accelerated exfoliation of the skin induced by a chemical agent such as glycolic or mandelic acid. 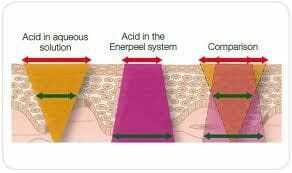 The depth and results of the Sydney chemical peel depends on the strength of the chemical agents used, the type of active ingredients incorporated into the peel, the skin type and the skill of the operator. Superficial peeling agents cause an increased slough of the outer layers of the skin resulting in a mild to moderate peeling. The superficial peeling will result in skin renewal with the reduction or disappearance of sun damage, pigmentation, acne lesions, fine lines and wrinkles Moderate and deeper peels cause removal of the top layer of the skin, inflammation and regeneration of the lower layers. Downtime is more pronounced. With all chemical peels by Sydney's Alpha Cosmedic Clinic, extreme caution must be taken with homecare to avoid any complications. Deep chemical peels are performed by a medical professional. Skinstitut peels are made from a variety of potent cosmedical skincare ingredients such as botanical vitamin A, natural fruit acids and enzymes. Click here for pricing details on our range of Sydney chemical peels.